The end is near. The end of this series, that is. JK Rowling needed seven books to complete her magnum opus; mine will likely run to ten installments by the time I get it all out of my system. And like Rowling, I’m hedging on that. I might need an extra post or two to finish frosting my bloggy cupcakes, ya know? Anyway, today I thought I’d share and solicit tips for a successful road trip with kids. I have to tell you, the boys were amazing on this trip. I never would have imagined spending in excess of 30 hours in a week locked in a car with two energetic little boys could be such an enjoyable experience. They’re veteran road-trippers now, and Beloved and I were full of speculation on the drive back into Ottawa on where we could travel next summer. The whole eastern seaboard seemed within our grasp, from Florida to Newfoundland — until it occured to us that if all goes according to plan, we’ll have a newborn next summer. Ugh. So much for travel freedom! I’ve always loved a good road trip (hat tip to Fryman, with whom I shared many, many road trips over the years) and when my folks lived in London I used to make the six-hour trip at least one weekend a month. For one busy year when Beloved and I first started dating, I’d drive down to London to see him almost every two weeks. I don’t clock quite so many miles in on the 401 anymore, but we usually drive five or six hours to see family a couple of times a year, either down near Toronto or up through Algonquin Park. All that to say, the boys are already good travelers – but they far exceeded my wildest hopes for them on this marathon trip. We ended up driving about seven hours each day, which was just about enough if not about an hour too much. We’d leave after breakfast and arrive in time for dinner, and stopped on average around every two hours. Half way through the second day, Tristan figured out that if he said he had to pee, we’d stop somewhere (yet another reason to love the two-lane highways instead of the Interstate: we were always within 10 minutes of an Exxon station or a general store or something with a bathroom.) After the third shrug and “oh well, I guess I didn’t have to go after all” in half an hour, we had a little chat about how much longer the trip would be if we stopped every 11 minutes to pretend to pee, and the situation improved considerably. A while back, Chantal and Andrea debated the merits of DVD players on road trips, and I’ve always been firmly in favour of them. What surprised me on this trip is how seldom we actually used ours, and that it was the boys who occassionally declined the opportunity to watch something. I think we used it as much in the hotel rooms to get them to settle down at night as in the car. I didn’t spend as much time as I would have liked preparing my little bag of tricks to distract the kids, but it turned out I had more than enough. In addition to having the maps and my notebook and the camera in my lap, I spent the entire road trip with a bag of kiddie treats at my feet. Every hour or two, pretty much whenever it became obvious that the boys were getting particularly twitchy, I’d pull something else out of the bag for them. Divided over four days’ worth of relatively equivalent bags, I had snacks, drinks and other distractions. For snacks, I had individual baggies of small amounts of stuff like pretzels, trail mix, fruit snacks, and cookies. (Tip: don’t bring things that liquefy in 36C heat, like yogurt-covered raisins or mini-Aero bars. Ick.) I had a couple of juice boxes, a couple of bottles of water, and some rubbermaid drink boxes. I had colouring books, sticker books, and a book of mazes – Tristan loves mazes right now – and a box of crayons for each of them. Each boy had a dollar-store cookie sheet with a rim on it to use as a lap desk, perfect for containing runaway crayons and also fun to stick magnetized letters on. I had a couple of different sheets of stickers. Most of the stuff I actually already had lying around the house, but one great investment was a 5×7 blank sketch pad for each of them. Simon stuck a few stickers on his and lost interest, but Tristan drew pictures, wrote letters and filled more than half the pages in his sketch book. There were also a very few small toys, all pilfered from forgotten drawers, and a deck of phonetic flash cards from the dollar store that had Disney and Pixar characters on it. Before we left, I stood for quite a while in the toy section of WalMart, considering the hand-held electronic games. The few that the boys have seen, mostly cheapo stuff from Happy Meals, have engaged them, and I thought long and hard about getting one for each of them. In the end, I didn’t and I’m glad. I’m sure we have a lot of Game Boy days ahead of us, and I’m happy to put hold off as long as I can. We played a few car games, but given the fact that we were driving with all the windows open to combat the heat, conversation was not always easy. The boys’ favourite game is “I’m thinking of a (blank).” The blank started out being an animal, but has since moved on to be just about anything. The boys’ favourite topics are movies, foods and people they know. It’s basically 20 questions for preschoolers. Simon has improved from choosing the same thing every time it’s his turn to think of something, but now has the unfortunate habit of changing his item half way through the game when he gets distracted and forgets what he’s supposed to be answering questions about. He’s more like his mother every day. While Tristan mastered the famous “how many more minutes” question on this trip, and I’m sure I would have gone postal if I had had to share just one more bathroom stall with multiple occupants, I still have to say that I’m incredibly proud of how well the boys traveled. I’ve got a couple more weeks of vacation coming up, and with this trip still fresh in recent memory, we’re already considering a six or seven hour drive to Lake Huron for my birthday. That’s the mark of a good road trip, when you come home already wondering when your next trip will be. Do you have anything to add? What do you do to make long car trips with little kids bearable? 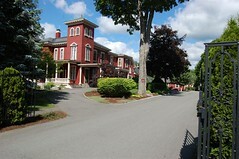 We left Bar Harbor early on a sunny Saturday morning, with a plan to follow Route 2 back the way we came and stay once again in St Johnsbury, Vermont, for the night. But first we had one special stop planned – and another unexpected one that delayed us for a little bit. We were heading north away from Mount Desert Island on our way to Bangor, Maine through the small town of Ellsworth and I was mourning the fact that we had just passed the not-yet-open LL Bean outlet store when Beloved said, “Does he mean for me to pull over?” I looked in the mirror and sure enough, there was a cruiser with lights flashing behind us. One of Maine’s finest approached us carefully and stood just behind Beloved’s open window – just like on Cops! I’m sure we looked threatening, what with the car load of luggage and the boys wearing a felt lobster hat and a pirate hat, and me with my usual lap full of Nikon and maps and Scooby Snacks for restless travelers. Seems we had stumbled into a 25 mph zone at a 45 mph clip (to Beloved’s credit, I hadn’t seen any signs) which would have been a fine in excess of $300. The cop was a good guy, though, and when we checked Beloved’s driving record and found it reasonably clean – I only wish I had been driving; can you believe it’s the first time I’ve ever even been in a car pulled over for speeding, let alone been tagged with a ticket – and dropped the fine to $137. Even better, we could pay the fine online rather than having to pay it before we left the state; the story of the Ottawa student jailed 11 hours for speeding in Georgia a few months ago was a little too fresh in my mind! So we had one more expensive souvenir of Maine, and the classic experience of having our oldest son ask in a tremulous voice, “Is Daddy going to jail?” to add to our vacation memory book. With a sinking feeling, I realized that Beloved would not drive one mile per hour over the posted speed limits for the rest of the two-day drive home. It was still early in the day when we pulled into Bangor in search of my literary hero. Our first stop, just off the Interstate, was Betts Bookstore on Hammond. I’d corresponded with the owner, a fellow named Stu, and he’d promised me a map of some of the key attractions on the Tommyknockers and More bus tour that highlights some of the places Stephen King has immortalized in his many books. It was a lovely little bookstore, and the owner was a gentleman. He had a little white poodle in the store that engaged Simon while I briefly browsed and wished I had $1200 or so for a signed first edition King book. I settled for a t-shirt and a fridge magnet (we collect fridge magnets of places we visit on all our family trips) and a brief chat with Stu. The map included directions to Stephen King’s house, just around the corner, and I asked if the He ever dropped by the store. “Not anymore,” said Stu regretfully. “Not since his accident. He used to drop by our old location two, three times a week, but we just don’t see him anymore.” This confirmed what I’d read elsewhere, that the formerly gregarious Stephen King, whose house used to have open doors and the best treats every halloween, has become extremely reclusive and guarded with his privacy since the 1999 accident that nearly killed him. With all this in mind, we piled back into the car and drove the short few blocks down Hammond (ironically, a continuing extension of my beloved Route 2 East) to West Broadway. 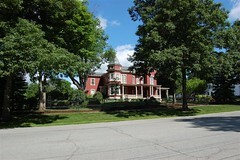 It’s a leafy, quiet street lined on one side with more modest homes and the other with larger rambling homes that one could comfortably call mansions. Stephen King’s house is set unassumingly in the middle of a few similarly-sized houses, and we pulled over to rest in the shade of a large tree to consider it. “You’ve come all this way,” Beloved said. “Aren’t you even going to get out?” I hesitated, feeling rather foolish. He was right; ever since the idea of Maine crystalized out of the ether into our vacation destination of choice, the idea of Stephen King had been woven firmly into the idea. I’d been reading his latest book throughout our trip, and my perception of Maine has been coloured largely by what I’ve read through a lifetime of voraciously consuming his novels. Here I sat, in front of his very house, too shy to get out of the car. Eventually, I did. It was just before 9:30 am on a gorgeous late-June morning, the sky clear blue above me. On such a summer morning across America, homeowners were pushing lawnmowers in their yards or drinking coffee with the morning paper on the porch, and I peered hopefully at the house and grounds hoping against hope to see Stephen King himself engaged in some sort of similar weekend pursuit. I slowly paced the length of the wrought-iron gate, admiring the italianate style of the gorgeous house and the well-tended grounds. I even peered hopefully at a few windows, feeling more stalkerish by the minute as I snapped pictures of the motionless house. 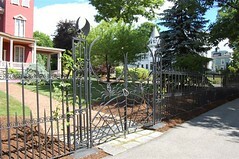 The iron gates themselves are quite the feature, embellished with spiderwebs and bats and various kinds of gargoyles. By the time I’d paced the length of the property, I’d realized that the gate to the driveway stood wide open and a silver Mercedes sat quietly in the shade at the top of the drive. I lingered for a long moment in front of the open gate, looking at my clear path to the front door. I considered the odds of me ever being in Bangor, ever being this close to Stephen King again. I thought about how much I admire him, how much of an influence he has had on my own writing style, how in 20 years he has never strayed from my top-five list of favourite authors. I willed him to stroll out of the house, maybe on his way to the grocery store or the hardware store or any of the other errands mere mortals run on a Saturday morning. The house remained inscrutable and silent in the morning sun. I pictured myself walking up that curving drive, mounting the porch, ringing the bell, and asking in my politest Canadian manner if I could trouble the Great Man for just a minute, a moment quick enough for a signature, maybe a photo, certainly the encounter of a lifetime. In the end, I couldn’t bring myself to do it. With a last regretful look over my shoulder, we drove away. I even scanned the nearby sidewalks with hope of seeing Him maybe taking the dog for a morning stroll, but the streets were calm and deserted. We tried to find the Barrens, made famous in IT and identified as one of several locations on my map of local attractions from King’s stories, but we got turned around and I could feel the pressure of the drive ahead of us bearing down. We decided instead on a little detour to Target, which itself took much longer to find than it should have. We spent maybe 20 minutes or so perusing the toy section, but I simply wasn’t in the mood to shop, becoming more twitchy by the minute. By 11:00 we were back in the car, heading west on I95, headed back to Route 2 for the long trip back to Vermont. What do you think? Would you have walked away too, or would you have taken the risk and walked up to the front door and rung the bell? Ottawa to Bar Harbor Part 7: Lobsters! I’ve never been a huge lobster fan. Part of it is the fact that you must cook them live (let alone the supposed scream factor.) I remember my brother, quite young, being invited over to someone’s house for a lobster dinner. They put the lobster in the pot and started to cook it, and for a joke the father took the lobster back out and put it on the counter – and the lobster started to crawl away. Pretty much from hearing that story on, I wasn’t much on eating lobster. In Maine, they take their lobster seriously. By the time we got within 30 minutes of the coast, there were lobster pounds everywhere. (A lobster pound is the coastal equivalent of Ottawa’s ubiquitous chipwagon, although instead of fries and pogos and poutine from the deep fryer, they serve boiled lobster.) Every restaurant has lobster something on the menu; even McDonalds apparently has a lobster roll. I wouldn’t be surprised if Dunkin Donuts didn’t have a honey glazed with lobster donut. Although I couldn’t bring myself to actually eat Maine’s culinary signature dish, we did decide that it would be fun to go lobster fishing. At first, we were going to go on a whale-and-puffin watching tour, but some wise folks on Trip Advisor suggested that the whale watching tours can be long and boring (an hour or more just to travel where the whales are, and the same back again) for your average 3 and 5 year olds, not to mention the sea-sickness factor. I’m already constantly nauseous, thanks. So we downgraded from whale watching to a lobster fishing and seal watching tour. It was a lot of fun. 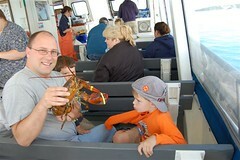 The trip was about an hour, and we learned about the various rules that govern the lobster fishery. Each lobsterman (pardon the term, but I’m simply not typing ‘lobsterperson’ each time) has his own unique set of colours for his buoys and is limited by the type of lobster he can catch. Pregnant females, for example, and ‘shorties’ that measure less than 5 inches, must be thrown back. They pulled up a few traps, and each trap contained at least one crab or shortie lobster, but since it was early in the season, we didn’t catch any big’uns. They had a couple of full-size specimens in their ‘touch tank’ and they passed a couple of mature, live lobsters around for everyone to hold. Once I got hold of one and had a chance to see him eyeball-to-antennae, there was no way in hell I was going to eat one of those things. Beloved didn’t have the same reservations; he ordered ‘lazy lobster’ (lobster already divested of its shell) for dinner that very night. They also passed around a crab and a sea cucumber, but as we watched the tour guide describing the sea cucumber it let forth a long and vigourous arc of what could only have been sea-cucumber pee, and we were all disinclined to hold it after that. Simon did hold a live starfish, apparently more properly known as a sea star, for a few minutes. I think he still has my fingerprints bruised into his forearm, so tightly was I holding his arm to make sure he neither (a) pitched it overboard, (b) dropped it, or – worst of all – (c) tried to actually make me touch it. Did you know that a starfish sea star opens clams by suckering on to them with its tentacles, then pries it open just enough to stick its stomach into the clam shell to begin digesting the meat? Ick. No really, ick. Personally, I liked the seal watching a lot better than the creatures with the antennae and the tentacles. 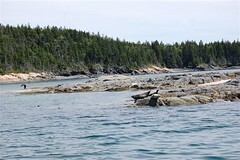 There was one rock shelf in particular known as “puppy ridge” or something like that, and we could see a dozen or so harbour seals frolicking about in the water and sunning themselves on the rocks. We also saw a couple of bald eagles, and the bald eagles’ nest. Did you know that not only do they mate for life, but their nests can weigh more than 2,000 lbs? That’s a hell of a condo! After our boat tour through the gorgeous glassy blue seas (no seasickness today! ), we ambled back to our motel for a bit and let the boys chase each other around the playground to shake out some pent up silliness. Then we made our way back downtown – I’m telling you, the Island Explorer Shuttle rocks! – to meet Phantom Scribbler and her family for dinner. After dinner, not quite ready to go our separate ways even though the sun was definitely on its way down, we instead ambled kind of aimlessly toward the harbour and found ourselves on my other favourite beach. I don’t even know what this one was called, except that it seemed to be a municipal beach of sorts. I didn’t even realize it was a beach until I saw the signs permitting swimming, because it was right on the main harbour. There, in the dying light of another gorgeous day, we threw rocks into the waves and picked through the tiny rocks underfoot for pretty shells and bits of sea glass. That, and watching the four kids run blissfully through the nearby park (complete with fountain and Jesus singers with a guitar, to whom Simon in particular seemed drawn) made for a perfect end to another lovely day. Despite appearances which may be to the contrary through my rather extroverted blog personality, I’m actually rather shy. And the idea of meeting up with a total stranger, even one I admire as much as I admire Phantom Scribbler – one of my oldest and best bloggy friends, and someone I admire immensely – is enough to cause me a considerable amount of anxiety. The idea of meeting up with her far from home, with my entire family in tow, even more so. How will I know her? Will my kids behave? Will I clam up like a dufus, or run on inanely at the mouth like an insecure idiot? Will she like me? Pirate Golf, for those of you who haven’t had the experience, is high-end putt-putt with a pirate theme. One golfs up and down hills, under a waterfall and right on to a fairly cool pirate ship. 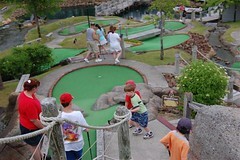 Myself, I love putt putt, but I’d been thinking that the boys were too young to enjoy it. I was wrong. Tristan and LG, Phantom’s son, took off to play together, leaving the doddering adults and 3-year-old set trailing behind. Simon soon lost interest in actually hitting the ball with the “stick” and just followed happily along behind the big boys. After maybe five holes, Phantom and I gave up any pretense of actually playing golf and just wandered along with our pack, but Beloved and Mr Blue doggedly played every hole – Mr Blue most often with a handicap of an armload of Baby Blue to contend with. Twice it rained hard enough for me to stash the camera away and trickled to a stop, leaving us frizzy in the humid afternoon. After Pirate Golf, freshly adorned with paper pirate hats, pirate flags and eye patches, we unanimously decided we needed an ice cream break and stood for three weeks in the world’s slowest lineup. Finally, sated on ice-cream, lemonade and milkshakes, we compared notes and decided to meet up after dinner the next day. Conveniently, Pirate Golf was half way between the KOA and Bar Harbor, so we each went our separate directions late in the afternoon. We puttered around the cabin for a bit, then decided that rather than actually try to make anything for dinner, we’d make our way back into town for a bite to eat. I had heard good things about Poorboy’s Restaurant, and they had an early-bird special that ended at six. With a little luck, we’d be able to make it. We hustled the boys into the car and made the 10 mile trek back into town, arriving at Poorboy’s at 5:45, only to find out they had a 45 minute wait. Not ready or willing to tolerate that, Beloved suggested we trek back to another restaurant we’d noted earlier in the day called Route 66. If you’ve seen the movie Cars, which my boys have seen at least 300 times, you know that Route 66 plays a big role in the movie. Good enough to sell me. It was a funky roadhousey kind of place with the usual pizza and burgers menu, an old jukebox, and tonnes of memorabilia on the walls – a sort of automotive Hardrock Café. We were about half way through our mediocre dinner when to my absolute delight, in walked Phantom and her family, who managed to sit at the table right next to us. I mean, Bar Harbor is not a huge town, but it has more than its share of restaurants. What are the odds? It was that Bar Harbor serendipity at work again. We retired back to the KOA for our last night in the cabin, and had an oceanside campfire with the most spectactular pink into purple into indigo sunset. A fitting end for a nearly perfect day. Ahem, yes, Bar Harbor. Loved it. LOVED it. Bar Harbor is a magical place, where you are walking along the street thinking to yourself, “Man, I’m hungry” and you look to the left and there is a lovely little restaurant called Testa’s that has opened its windows to the balmy summer air, and you decide to pop in and have the most delicious cheese omelette of your life. In Bar Harbor, when you’re just sort of wandering around getting oriented on your first morning there, and it starts to rain just a little bit, you think to yourself “Well, maybe we’ll just get in the car and drive around for a while until it stops raining.” So you take a random left and then a random right, and hey, lookit that, there’s the entrance to Acadia National Park. And you think, “Might as well check it out now,” so you do. And while you’re ogling the spectacular scenery and Tristan announces he has to pee, you stop at the first place you see – which appears out of the trees like he conjured it – and while you’re stretching your legs you look over to the left and realize you’ve stumbled upon a lovely oceanside beach. And then you realize that this is in fact Sand Beach, the one place that almost every local and previous visitor has told you that you must take the kids. And as you are making your way down to the almost deserted and breathtakingly lovely beach, you realize it has stopped raining. Yah, it was like that. Two of my very favourite memories of our trip have to do with beaches. The first was Sand Beach. I posted maybe half a dozen of our pictures in the Flickr set, but I must have taken 50 or more in that location alone. We spent a wonderful hour or more just wandering along the surf line, letting the boys run in up to their ankles and back, enjoying their shrieks of delight as the salty 55F (brrr!) waves splashed up at them. It was such a calming, restorative, fresh and simply enjoyable hour. The boys could run freely and explore (if you look at the pictures on Flickr, you’ll see that they never let go of their lightsabers, perhaps the most well-traveled lightsabers since Obi Wan himself). The morning was damp from the sprinkling rain, and the smell of the salt air was heady and refreshing. It was dizzying to look out and realize I was looking out to the vast Atlantic itself, and even though the seas were relatively calm, there was just enough of a surf to delight the boys. We could even detect a discernable temperature difference in the air from one sheltered corner of the beach to where the ocean breeze blew directly in. I can’t imagine a more lovely place or time. I’d go all the way back to Bar Harbor again, just to spend more time there. When we finally tore ourselves away, and none of us really wanted to move along, it was a unique challenge getting the ‘sand’ off the boys’ feet. Not sand at all, in fact, but tiny grains of pulverized shells. After first trying to brush off the last stubborn grains with my hand and then a sock, I actually had to use my fingernail to gently scrape the tiny shell fragments off the boys’ ticklish feet – in itself a lot of fun! Behind the washrooms and changerooms adjacent to the beach, Tristan had spied a ‘secret trail’. With the sun breaking through the clouds and the temperature at least 10 degrees higher than it had been on the beach, we decided to go for a little hike along the Ocean Path trail. The famous Thunder hole was only a mile’s hike, and we figured that would be within the boys’ capability. Stop to laugh at me now if you must. It was just before lunch time, the temperature was rising by the minute, neither Beloved nor I was exactly sure how far ‘a mile’ was and how long it might take to walk it, and Simon had no pants on – they had been soaked by the surf – and was waddling along in a t-shirt and diaper. A perfect time for a hike? Maybe not so much. But you have to give me credit for idealism. Alas, we never made it as far as the Thunder hole, but given the calm seas of the day, I suspect we wouldn’t have seen much if we had. When Simon started asking to be carried, we knew we had reached the end of our particular trek, and turned back the way we came. But even in the 20 minutes or so we had hiked, we had enjoyed some gorgeous views from high above Sand Beach on one side, and up to a mountain towering above us on the other. Mere feet from the trail head and true to my family’s legacy of klutziness, I went down hard as I stumbled and fell on what was probably the only pothole in the Ocean Path. It’s long been a family joke that if there was a six-inch hole in an acre of land, we’d find the hole and fall in it. The good news is, I protected both the Nikon around my neck and the passenger in my uterus from serious trauma. And I got a lovely scabbed knee, with which the boys were fascinated, as a souvenir of my visit to Acadia National Park, bringing a little park dust home with me. The magical serendipity of the morning continued as we piled back into the car and began to wonder what to do next. My cell phone rang and it was the incomparable Phantom Scribbler, also in Bar Harbor with her family on vacation. We compared notes and schedules, and decided to bring the families together on a bloggy play date for a round of Pirate Golf in a little over an hour. With our next destination settled but time on our hands, we spend the rest of the morning following the Park Loop Road on its 27-mile loop through Acadia National Park, with Simon’s shorts dangling from my window and drying in the warm summer breeze. Carriage Roads (motorized vehicles forbidden) and rocky cliffs, breathtaking ocean views, stone bridges and cottage mansions, forests and mountains… again, I only wish we had had more time to explore this most amazing place. But who could resist the siren song of a bloggy playdate and Pirate Golf? We chose Bar Harbor randomly. I’d just finished booking our annual Free Camping Weekend through the KOA in the 1000 Islands, and was futzing about with the KOA website, idly thinking in the March chill of sunny summer days. 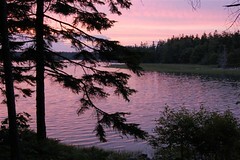 So when we chose Bar Harbor, we already had camping – cabin camping, that is – in mind. And when we saw that the cabins had ocean views, that sealed the deal. When we decided to add a third night in Bar Harbor, it was cheaper and easier to simply book a hotel room in town, so we did. In retrospect, I might have cut the camping part out of the vacation and just gone with the Bar Harbor Motel for all three nights. We liked the “Kamping Lodge“, as the KOA called it, because it was spotlessly clean, right on the water, had a separate bed and living space, and a small kitchen including range-top, fridge and microwave. The campground itself had all the usual amenities, but the pool was in a second campground a five minute drive away, so we never got around to using it. The KOA itself was easy to find, as it was literally the first thing we saw once we crossed off the mainland onto Mount Desert Island (Bar Harbor and maybe half a dozen other small towns populate the island, along with Acadia National Park.) So close were we to the highway that we could see the tail-lights of the cars waiting at the stoplight as they crossed the bridge from our campsite. But we had to bring our own sleeping bags, pillows and towels, which took up a LOT of room in the car. And sleeping in four places over five nights made us feel a little too nomadic and homeless. No real regrets, but if I had to do it all over again, I think I’d stick with the motel. It too was spotlessly clean, and we happened to score a room directly across from the small playground and a pool that we never had a chance to enjoy. It also had a small fridge in the room, and the employees could give lessons in hospitality to the KOA folks. It was also half the price per night of the KOA – but of course, without the ocean (well, Western Bay) view. The biggest plus about the motel was that it was actually in town, instead of a 10 mile drive. They have a wonderful shuttle system set up in Bar Harbor called the Island Explorer, and we could hop on the shuttle from our motel and be in the Village Green within 10 minutes. They run every half hour in the early part of the day and every 15 minutes in the afternoon and evening. The best part? Free.